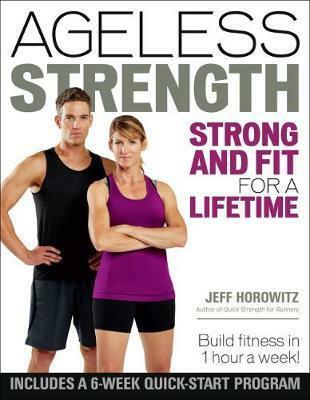 Ageless Strength shows athletes and active people how to build sustainable fitness for a lifetime of active pursuits. It’s a myth that our older years only bring physical decline. While it’s true that we lose strength, bone density, and balance, our bodies react the same way to training at any age. The answer is not to go easy on our so-called fragile bodies–that traditional approach of gentle, easy fitness just guarantees loss. The key is to push our bodies in the right ways. A smart mix of strength training can counteract the physical effects of aging–and keep you strong and fit for years. With the program in Ageless Strength, you can get into the best shape of your life at any age. In his proven program, coach and trainer Jeff Horowitz reveals exercises that fight back against the years. His dynamic and engaging mix of 50 simple strength exercises will build strength, bone, and balance–combating the top three physical changes that lead to injury and loss of strength. These effective exercises use bodyweight or minimal equipment so that no gym membership is required. Each functional strength move mimics a real-life motion so you’ll know it will help your day-to-day fitness. The 6-week quick-start program will get you up to speed, then you can follow the long-term strength program or select from the color-coded exercises to design your own. In just two 30-minute sessions a week, Ageless Strength offers a simple, effective way to get strong and fit for a lifetime of active pursuits.